Tech fell to 4-4 on the season Tuesday night with a 5-3 loss to Kennesaw State. Still in search of his first win of the season, freshman Zac Ryan got the start on the hill for the Jackets and went 4.1 innings, allowing six hits and two earned runs and was given the no decision. 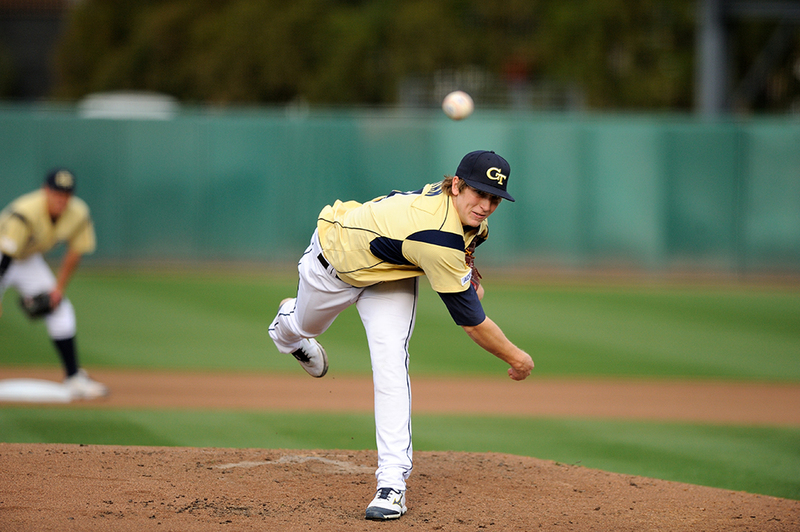 Senior reliever Dusty Isaacs picked up the loss for the Jackets and dropped to 2-1 on the season. Mason Ward was the winning pitcher for Kennesaw State, pitching 1.1 innings of relief while striking out one. Freshman shortstop Elliot Barzilli went 3-5 with for the Jackets and freshman third baseman Brandon Gold went 2-6 with an RBI. The Owls were led by center fielder Bo Way, who went 3-5 with an RBI and a double. Kennesaw State opened the scoring in the top of the first. After Ryan got leadoff hitter Kal Simmons to pop out, Owls’ left fielder Jacob Bruce reached on a sharp line drive single to right field. Center fielder Bo Way drove in Bruce on a double to the right field gap to put the Owls up 1-0. Ryan got the next hitter to pop out for the third out of the inning. Kennesaw State would strike again in the top of the fourth. The Owls opened the inning with back-to-back singles by Max Pentecost and Bo Way to put runners on the corner with no outs. Ryan struck out Chris McGowan for the first out, but Way advanced to second on a steal. Designated Hitter Brennan Morgan drove in Pentecost on a fielder’s choice to increase the lead to 2-0. The Jackets would end the inning on a fantastic running catch by sophomore Matt Gonzalez, and Ryan escaped with only giving up one run. Tech threatened in the bottom of the fourth with back-to-back two out singles by freshmen Gold and Barzilli, but senior second baseman Mott Hyde flied out to end the inning before the Jackets were able to get any runs across. Kal Simmons got his second single of the day with one out in the top of the fifth, prompting Hall to make a pitching change, which brought in freshman Tanner Shelton to face the lefty Jacob Bruce. Shelton got the job done, forcing Bruce to ground into his inning ending second double play of the night. “I was impressed by [Shelton]. He’s throwing the ball really well and today he did a very nice job,” Hall said. Tech finally got on the board in the bottom of the sixth. Gonzalez reached on a throwing error by Kennesaw’s third baseman with two outs, and Gold followed that with a line drive single to right field to drive in Gonzalez and cut the lead to 2-1. Tech was threatening again in the seventh inning after a leadoff single by Hyde and a sacrifice bunt by freshman catcher Arden Pabst that advanced Hyde to second, but Tech was unable to score after fly outs by pinch hitter Kennan Innis and freshman right fielder Ryan Peurifoy. With one out in the bottom of the ninth, Tech still trailing 2-1, Barzilli ripped a double down the left field line. After a strike out by Hyde, pinch hitter Mitch Earnest hit a slow grounder to the shortstop, but KSU’s Simmons committed an error that allowed Barzilli to reach third and Earnest to reach first safely. Next up was Innis, who drove Barzilli in on a bunt single down the third base line to tie it at 2-2 and send the game to extra innings. Simmons walked to start the eleventh for the Owls and advanced to second on a sacrifice bunt. Senior pitcher Dusty Isaacs, who had replaced Alex Cruz on the mound, made a wild pitch, and an overthrow of third base by catcher Grant Wruble allowed Simmons to go from second to home and put KSU up 3-2. Tech tied it up at 3-3 in the bottom of the inning with a two out single by Innis followed by a double by Peurifoy. Pinch hitter Eric Know struck out to end the inning and left Peurifoy stranded at second. The Owls scored what would be the game winning runs in the top of the twelfth. With two on and two out, second baseman Dylan Ivey hit a fly ball to right field which was dropped on the run by Eric Knox. Both runners scored and KSU won 5-3.